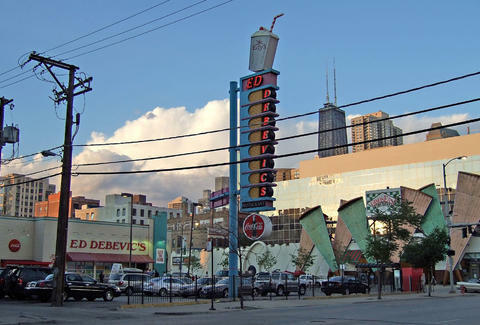 Ed Debevic's, a retro diner in River North that's long been popular among tourists and known for a wait service that will almost certainly insult you, confirmed Friday afternoon that it is closing and planning to relocate sometime this year. "As our famous saying goes, 'Eat and Get Out.' I can confirm that it is likely Ed Debevic's will be leaving its current address at 640 N. Wells Street, at some time later in the year," Jeff Himmel of Debevics, LLC., which owns Ed Debevic's, said in a statement. "We're currently looking at locations closer to Michigan Avenue. We invite our fans to join us in our final days at the corner of Wells and Ontario." Earlier Friday, Crain's Chicago Business reported the restaurant will be demolished to make way for a high-rise residential development. The tourist magnet first opened in 1984 offering Chicago a retro-themed eatery with burgers, hotdogs, milkshakes, and several helpings of sass -- and sometimes, genuine meanness -- served up by "quirky" costumed servers. So, basically, don't expect any fond farewells. Tony Merevick is Cities News Editor at Thrillist and remember seeing lots of tourists wearing those paper hats when he lived in Chicago. Send news tips to tony@thrillist.com and follow him on Twitter @tonymerevick.